Think of Foundation as the complete base of your make up. Like anything make up starts with a foundation and like a house, if the foundation is shoddy then the house will fall down. The foundation is everything. It sets a platform for the rest of the makeup to be built upon. Get this important phase wrong and there is no coming back from it. What makes the right foundation for you? Everyone is different. Not everyone gets along with the same products and there are likely thousands of foundations on the market and that can make finding the right one difficult but follow the following rules of foundation and you can’t go wrong. When a builder lays the foundations for a house the ground must first be prepped and the exact same goes for the face. Skin should be cleansed and moisturised and dry skin may even need moisturising twice. You should allow time for the moisturiser to absorb and settle into the skin first before rushing to apply foundation. If skin is not correctly prepped dry skin will cause the makeup to look ‘cakey’ and build up in drier areas. You may find some foundations work best with primers so if you aren’t getting the full benefit of your foundation consider trying a primer in combination. If your foundation is incorrectly matched to your skin colour then frankly there is no point wearing it. Too light a shade will just wash you out. Too dark a shade and you will look completely ridiculous. There is some marginal grace between shades however and adding bronzer can help makeshift a foundation a shade or so too light but even the best bronzers can’t bring you back from anything more than that. Remember as well that if you use fake tan or are lucky enough to get an actual tan, then your foundation colour may change depending on how dark your skin goes. Remember If you can’t find the exact shade you can mix two different colours together to achieve the desired shade if in doubt speak to an assistant or specialist to offer recommendations. Foundations, like people come in many different variations. Mousse, powder, cream, liquid, gel etc etc. Depending on your skin type will depend on the formulation best suited to your skin. 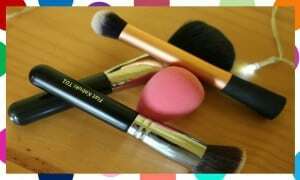 For example powder foundation can sometimes sit on top of dry skin and look flaky and some cream and liquid foundations make oily prone skin worse. Whether you buy your make from the drugstore or a high end department store see if you can get a sample to take home or try the tester in the store and wear it over the course of the day. This allows you a chance to experiment with the different variations and find the best for you. If you are going to a makeup counter discuss with an assistant their recommendations for your skin type first. Remember our skin types can change throughout the year depending on lots of different outside factors which may mean you need to change the formulation of the product you are using. It’s so easy to apply foundation and forget to blend the jawline and have an obvious foundation line around the face. This line isn’t always obvious in the mirror but in public it will be hard to miss. 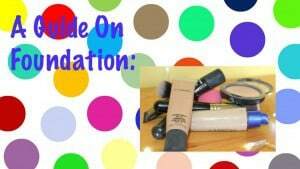 Blending is a huge factor when it comes to application of foundation whatever you do don’t miss this step!! 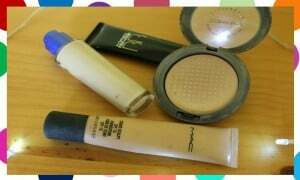 Too much foundation will look caked on but too little can be patchy. Depending on your complexion some people can get away with a light coverage like that offered from a tinted moisturiser or a BB style cream. Some people however need a more full coverage but instead of applying more consider choosing a fuller coverage product. I hate the phrasing of this one because there is no right or wrong way to apply makeup it’s personal choice and preference for each individual. What I will say though is that some foundations do work better with certain techniques so don’t be afraid to step out of the box and try something new if you aren’t entirely happy with your foundations appearance. Sometimes it’s not the foundation that is wrong but the application. There are many different ways to apply foundation such as brushes, fingertips or sponges. Experiment with as many different techniques as you like and find the one that best suites you and your current foundation. Don’t feel you have to stick with your choice for life. When you have run empty consider trying a new brand, formulation and even different application method. You never know you may find a new favourite. I hope you enjoyed reading this post. You can find more about me here. I try and put out new posts weekly so don’t forget to follow me so you never miss a new post. If you have any comments I would love to read them so please leave them below! Don’t forget to head over to my Youtube channel Soph-obsessed for more! This post is in no way sponsored. All products shown are from my personal collection and all images belong to me. This is a great guide, it has definitely given me loads of tips.